First Line: Two two-gallon cans of paint weigh about five times as much as he'd thought they would. Rose and Miaow are out of town visiting relatives, and all Poke Rafferty has planned is getting the apartment painted while they're gone. But, like all best laid plans, everything goes downhill fast when Poke leaves the local hardware store with his paint. There's noise, shouting, and a man barrels into Poke, sending them both down on the pavement. Holding the man in his arms, Poke realizes the man has been shot, and the stranger only has time to choke out three words before he dies: Helen Eckersley. Cheyenne. Within seconds the police arrive and deny that the man was shot. That same night, Poke is interrogated by Thai secret agents who insist on knowing what the dead man said, but he can't remember. When he is finally allowed to go home, he finds that the apartment has been ransacked. Not long after that, Poke knows that he's being followed. The second time men in uniform show up at the door, Poke manages to give them the slip, and thus begins his life as a fugitive. It's not easy hiding from everyone who's looking for him, and as Poke tries to fly beneath the radar, he manages to gather bits and pieces of information and put them together. He's caught in the margins of the war on terror, and his opponent is a master artist whose medium is... fear. I love Timothy Hallinan's books because he writes beautifully, with intelligence, and from the heart. As he said at the 2012 Poisoned Pen Conference held in Phoenix, Arizona, the mystery is important, but at the heart of any story-- first and foremost-- are the people. Hallinan's characters are some of the very best in crime fiction, and his fast-paced stories give an outsider's unforgettable view of Thailand and its people. 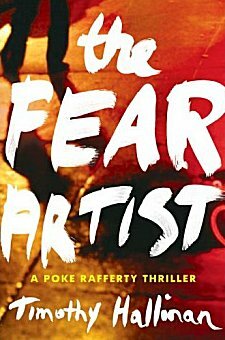 Poke Rafferty's life as a fugitive on the streets of Bangkok kept my pulse rate elevated. The people fighting the war on terror are deadly serious and seem to think nothing of employing any and all methods to obtain the information they want. As one character says in the book, "We're using bad people to fight bad people, and you do not want to be in the middle of that." Are Americans sometimes the bad guys in Timothy Hallinan's books? Yes. But so are Thais and people from many other countries. That's what happens when you enter the world of Poke Rafferty and Timothy Hallinan. You fall in love with Thailand, and you're besieged by the rich tapestry of characters this very talented writer has created to people his landscape. Open the cover of one of his books, and you're not only investing your time, you're investing your mind and your heart. Cathy - One thing that really separates this series from stereotypical thrillers is that Hallinan's characters are well-drawn. You're absolutely right about the setting but one cares about the people. The characters are the heart and soul of the books. This book sounds engrossing. Maybe I should put it on my list for reading while I'm having chemo. I'm also looking for some light, fun reads for that time and my list is waaaay long.